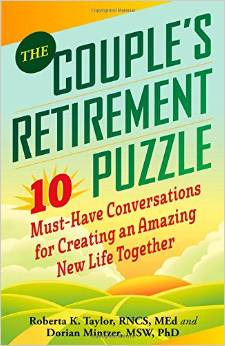 Dorian Mintzer and Roberta Taylor have become Amazon best-selling co-authors with the updated edition of their new book, The Couple's Retirement Puzzle: 10 Must-Have Conversations for Creating an Amazing New Life Together. The Kindle version reached number 5 on the Amazon Best Seller lists in the Kindle category of Aging Parents, number 29 in the Kindle category of Personal Health, and number 36 in the Kindle category of Retirement Planning. The paperback version reached number 10 in the Books category of Retirement Planning and number 23 in the Books category of Aging. The Couple's Retirement Puzzle notes that retirement can be the best time of a retiree's life, but for couples, there's far more to it than cashing in their 401(k). The most important asset they have during retirement is each other, yet many couples aren't sure where to begin to prepare for retired life or what to consider as they do. Filled with smart practical advice, engaging anecdotes, and helpful exercises, The Couple's Retirement Puzzle will guide retirees to a fulfilling retirement they can enjoy and celebrate together. Mintzer, M.S.W., Ph.D., B.C.C. (Board Certified Coach) has written about many topics pertaining to transitioning to retirement. She speaks to professional and community groups. As a coach, she helps 50-to-70 something women, men, and couples reinvent themselves in the next stage of life. She's the founder of the Boomers and Beyond Special Interest Group for interdisciplinary professionals, and the 4th Tuesday Revolutionize your Retirement Interview Series for professionals and the public. She is co-author of The Couples Retirement Puzzle: 10 Must-Have Conversations for Creating an Amazing Life Together and has also contributed to Not Your Mother’s Retirement, Live Smart after 50!, 65 Things to do When you Retire, The Six Secrets to a Happy Retirement, 65 Things to do When you Retire: Travel and 70 Things to do When you Turn 70. Mintzer combines her personal and professional experiences as a therapist, coach, teacher and speaker with her expertise in adult development and life planning as she works to help people navigate the second half of life. She uses her energy, enthusiasm and passion and creates a dynamic learning environment that energizes and inspires her audiences and her clients. She has a deep belief in the capacity of people to develop a "realistic optimism" about aging and create purpose and meaning in "the second half of life." For more information on Dorian Mintzer, visit her at http://www.revolutionizeretirement.com. Get E-mail Alerts When Dorian Mintzer, Ph.D. BCC -- Retirement Expert Sends news releases.